Ryokan is one of my best friends and teachers of the heart, and I hope he will become your friend too. His name can be spelled in many ways, like Ryoukan, Ryohkan, or Ryookan. He is one of the most well loved monk-poets that walked the roads of the poor of Japan. He lives on as one of Japan's best-loved poets, the wise fool who wrote of his humble life with such directness. Ordained as a Soto Zen priest and certified as a master, Ryokan chose to express his practice of the Way through living as a hermit in the countryside, begging for his food as was done by the Buddha and His disciples in ancient India. Ryokan had no disciples, ran no temple, and in the eyes of the world was a penniless monk who spent his life in the snow country of Mt. Kugami in Northern Japan. He admired most the Soto Zen teachings of Dogen Zenji and the unconventional life and poetry of Zen mountain poet Han-shan. "Who says my poems are poems? Then we can begin to speak of poetry." Ryokan never published a collection of verse while alive. His practice consisted of sitting in zazen meditation, walking in the woods, playing with children, making his daily begging rounds, reading and writing poetry, doing calligraphy, and on occasion drinking wine with friends. He got his Buddhist name from his teacher, the Priest Kokusen at the temple Entsu-Ji 円通寺 in Tamashima, after many years of practise in 1790. His certificate said: "RYOO (meaning GOOD) seems foolish, but the road is very WIDE (reading: KAN)". Ryokan, who loved people and has been loved by generations of people since, seems to be telling us something even today. He lived for 20 years in a small hermitage at the slope of Mt. Kugami 国上山（くがみやま）in Echigo province, Northern Japan. I visited this "Go-goo-An" (Gogo-An, 五合庵) many years ago, way up in the hills, quite far to walk to the nearest village to beg for alms. It is located in the precincts of the Temple Kugami-ji, but you reach it only after quite a lonely walk through the forest. It has just four walls and a roof and must be pretty icecold in winter, since this side of Japan receives a lot of snow every year. There is a spring nearby which is said not to freeze in winter. When Ryokan was 70, he met a nun named Teishin, and they fell in love. She was 28 and also a poet. They met rarely, but exchanged some of the most beautiful love poems in world literature during the three years they knew one another. When Ryokan was dying, Teishin was sent for and she held him as he died. Ryokan is well known for his fine calligraphy and he also painted for many purposes. One of the finest examples of Zen calligraphy ever brushed is a set of scrolls written by Ryokan for an illiterate farmer: i-ro-ha, ichi-ni-san (a-b-c, one-two-three), the beginning of the Japanese alphabet and the first three numbers in Chinese characters. The name stems from the name of a Japanese 18th century Buddhist renegade monk who left his order's path and moved to live near a remote village in western Japan where he spent the remainder of his life begging, living a Spartan existence, playing with the village children and becoming known for his love of nature and his beautiful poetically written insights about life. The monk, Ryokan, has been compared in temperament and message to America's Henry David Thoreau. The College has no affiliation with any organized religious thought, but its founder, Dr. Alvin P. Ross took the name in memoriam to his son who expressed deep appreciation for the monk's beliefs after taking Buddhist vows and being given the dharma name Ryokan. Entsu-ji is famous for being the temple where renowned priest Ryokan，lover of children and noted poet and scholar，trained in his youth. The temple holds the Ryokan Festival and the Ryokan Tea Ceremony annually. Entsu-ji was founded by priest Gyoki in the 8th Century. It is set atop a hill surrounded by beautiful gardens with trees，camellias and azaleas in Tamashima, close to Kurashiki in Okayama prefecture. The main Buddhist Deity at this temple is the Holy Kannon Bosatsu. 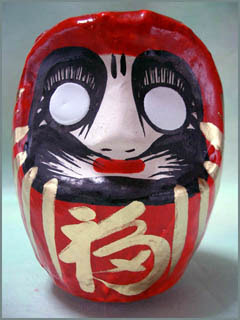 It used to be the only Daruma to make a wish (gankake Daruma) without eyes made in West Japan, but now there are several others. They are made from a metal form, but also from forms made of wood, pottery, clay and stone. This Daruma is made in memory of the famous Zen monk and poet Ryokan, who trained for ten years at the Zen Temple Entsuu-ji in Tamashima, as we have already learned. 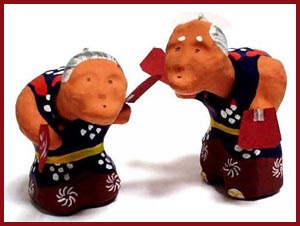 Hoping for a better future, Kikue Ono and her husband made their first daruma doll after the end of the Second World War, and she has continued to produce these good-luck figures in the fifty years that followed. They produce 14 different sizes, the biggest one is about 75 cm and the smallest one just one centimeter. The head is big with a large white face and huge eyes. The eyebrows and the beard are painted in bold strokes. On the belly the Chinese character for good luck, 福, is painted in a golden letter. Kurashiki flourished as a distribution base for goods transported on the Kurashiki River during the Edo period (1603-1869). The Kurashiki River flows through the center of the city, and even today, storehouse-mansions where rice, cotton, and other goods that passed through Kurashiki in the Edo period were stored remain along its banks. The roofs of these storehouse-mansions were laid with techniques used around the 6th century and the windows are wooden latticed windows. The walls are either simple white walls, or white with flat black tiles laid on top for increased strength, and the joints are strengthened with white mortar, producing a checked pattern of white on a black background. These buildings create rows of beautiful houses with a simple overall color scheme that blends well with the willow trees, and this is why Kurashiki is called the "white-walled town" (Shirokabe no machi 白壁の町). In the late Edo period (1603 - 1867), papermachee dolls became a popular celebration gift for a newborn baby boy. 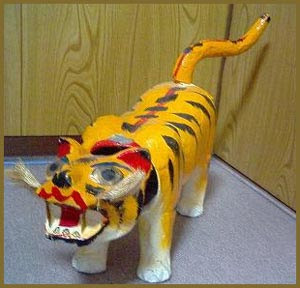 The tradition of displaying papermachee tigers on Children's Day has been maintained since then. Recently the twelve animals from the Asian zodiac, with a variety of colors are popular. Have a look at some samples on the following HP. Read about the history of this museum on the following HP. An old rice storehouse in the late Edo period (1603 - 1867) is utilized as a museum to introduce some commodities and folk crafts from various places in the world. Magosaburo Ohara (Oohara), president of Kurashiki Spinning Company, built the first Western museum of modern art in 1930. Magosaburo's friend and a painter as well as an art collector, Kojima Torajiro, started collecting art pieces with great support from Mr. Ohara. Later, Ohara Soichiro, a grandson of Magosaburo, added more and organized them.
. My Backup File .